This week customers can enjoy mouthwatering deals on shoes plus great discounts on various items in our daily deals page.It’s all about mouthwatering deals on Konga this week! Don’t miss out on two amazing promotions happening this week across different categories. 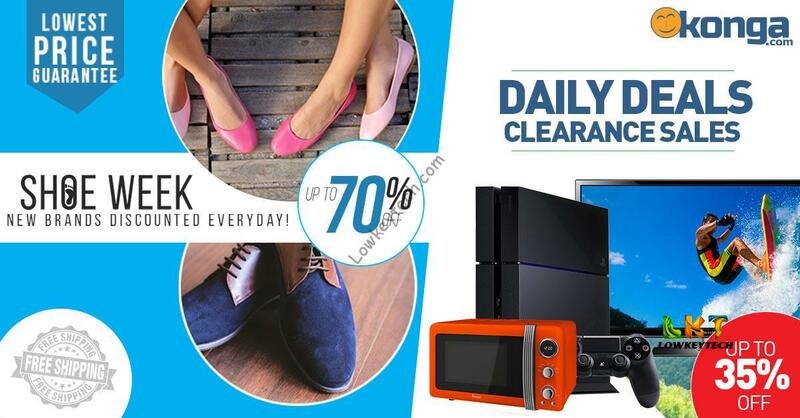 Get up to 70% off stylish male and female shoes in the TGIP Shoes promotion and up to 35% off General Merchandise in the Daily Deals Clearance sales from the 23rd of June to 30th of June 2015. Also save money in the Daily Deals Clearance sales where General Merchandise will be sold at up to35% discount. Air conditioners, mobile phones, TV sets, video games and much more from top brands are up for grabs for less. Take advantage of these promotions to save more money while you shop. Remember that free shipping applies on select items. Get your carts ready!